One of the biggest opportunities when running a tech-rich class is making sure your classroom management is on point. In my classroom I needed an easy way to get bellringers, assignments, homework, and links to my students. When I first started incorporating technology into my lessons, I would ask students to use Google to search for the link I wanted them to navigate to! This always invited unwanted discussions between neighbors, which in turn invited other students to chat, and soon enough, off task behavior ensued. There has got to be another way! 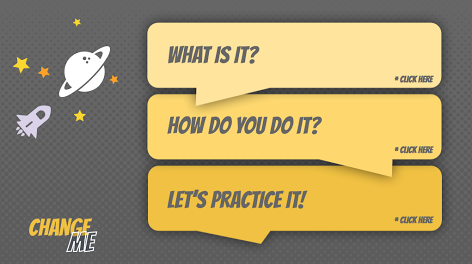 Take a look at this handy interactive Slide deck. 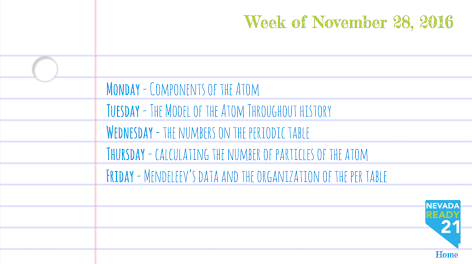 Using my lesson plans, I can easily add the week's bell ringers, assignments and links, and homework in one location. What's more, students who were absent the previous day can easily find out what they missed. 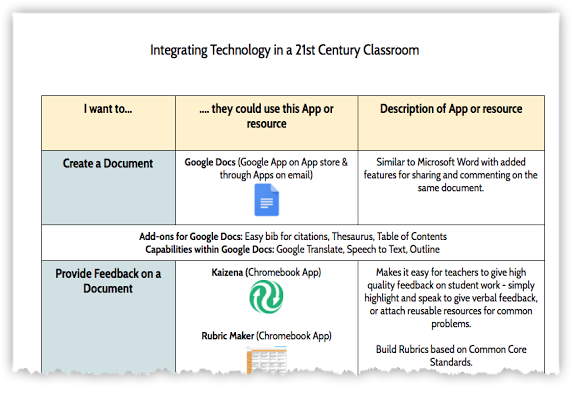 After you check out the sample assignments on the link above, download the template and start using it in your classroom to help manage how your students experience your class. On the last slide of the template, I have included Camtasia videos on how to embed the code into a Canvas page or how to link to it. 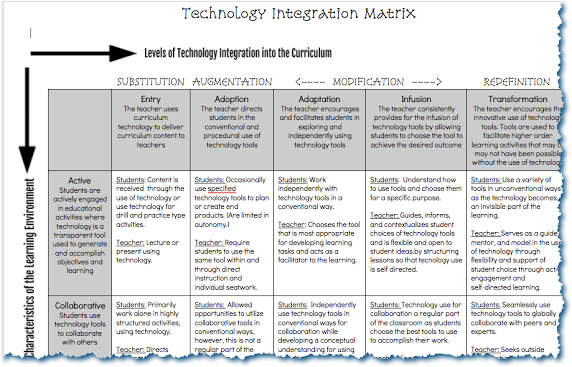 Allie, Digital Coach at Adobe MS in Elko, has shared a Technology Matrix she uses with her teachers. 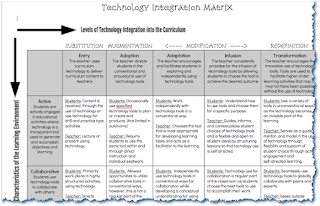 This matrix is a great way to check the levels of technology integration into the curriculum with the characteristics of the learning environment. Make a copy here. Allie from Adobe Middle School in Elko, NV has created an awesome HyperDoc with links to many resources and strategies on educational technology integration. The HyperDoc is set up so teachers can find what they want to do, then click on the appropriate app or resource that will help them do it. For example, if a teacher wanted to encourage interaction and collaboration between students, she may have her students post on Padlet, collaborate on Realtime Board, or organize a team project using Trello. 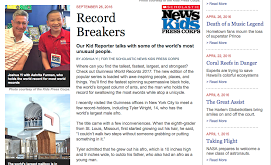 Check out the HyperDoc for a full list of incredible resources and descriptions. If you would like to share a resource with the Nevada Ready 21 team, use our form or contact one of the Professional Development Strategists directly. WeVideo and the 21C Learner course is starting January 9, 2017 and is full with two sections of 24 students! Communicating with 48 people can be difficult, especially when each person needs to know their specific section and group they belong to. I could have sent 48 individual emails to 48 different people with 48 different pieces of information they need to know... Or I could perform a mail merge and create 48 different messages at the click of a button! And I can do this all within the G Suite environment! Install autoCrat, the add-on available for Google Sheets here. This add-on allows you to take raw data in a spreadsheet (or collected from a Form), merge the information onto a Doc template, create personalized Docs, and email them to specific people. The best way to learn autoCrat is to install the add-on and try it out with the sample data and letter template below. Enjoy! Check this out: Concept Mapping. This is a stand alone professional development station that can be given out to teachers. You might ask, "this is all well and good if I would like to have my teachers learn how to make a concept map but what about other topics?" Never fret, Friends! You can make your own PD stations using this template. Populate the different pages with content, a video explaining how to do your topic, and some instructions for practicing. If you opened up the template link, you might notice that this is just a Google Slides deck. You might ask, "how do I present this link so the viewer is forced to see the presentation and not the slide deck?" Are you interested in learning more about the new Google Sites? The new version of Google Sites is easier to use and allows you to create a more attractive website. This free webinar by Eric Curts will show you how to use this new tool to make a classroom or organization website including a welcome page, calendar page, files page, links page, pictures page, and much more. Click here to register.